Floyd Mayweather wants your respect. Desperately. He’s crying out for it. Lashing out. In the ring and out, with sharp jabs or barbed insults. He’s fighting for it. But he has our respect, you might say. No. Floyd Mayweather is the greatest boxer of our time. That is not said out of respect, but fact. Indisputable. Like his record. Everything about Floyd can be measured in numbers: eight world titles, 44-0, the highest paid athlete on the planet. Yet with every win Floyd loses. He loses ground on the title he covets most. The one that can’t be appraised or quantified … can’t be hit. You can’t hit what you can’t see. Floyd, of all people, knows that. Floyd knows who he is, and more importantly, who he is not: Muhammad Ali, Sugar Ray (either of them), Rocky Marciano, Roberto Duran … those names, the truly hallowed ones of the sport, stand alone. Floyd stands unbeaten, but not unmatched. We celebrate Ali, we only tolerate Mayweather. The boxing fan is evocable in the way of a Sunday morning Baptist church congregation. The sport (though is there really anything ‘sporty’ about rearranging another man’s face?) unfolds so viscerally, so palpably; and the competition is absolute. By comparison, other athletes compete almost metaphorically. Boxing is literal. And, so, it is affecting. They absorb the blows, but we’re left with the impact. Ask an old-timer about Hagler-Hearns; Leonard-Duran; Foreman- Lyle. Watch them rear back, eyes closed, mind sprinting – you’d think they were retelling the story of Jesus’ resurrection. And this is part of the problem for Floyd (not the Resurrection – I’d say that worked out pretty well for everyone). Boxing doesn’t matter to us anymore. By association, neither does Floyd. He’s essentially Roger Federer with a right hook and a platinum chain. Well, a few platinum chains. The Champ has other issues, too. Mainly, that he’s defensive. Mayweather is harder to corner than a freeway – and that’s just outside the ring. Remember that Fight of the Decade that was supposed to happen with Manny Pacquiao? Floyd danced, weaved, and eluded it until we were indifferent. It was his greatest escape. It also made perfect sense. How would one of the greatest defensive fighters of all time protect himself (and his record) against his greatest challenge? By not accepting it. Sounds like something Mr. Miyagi would advise. 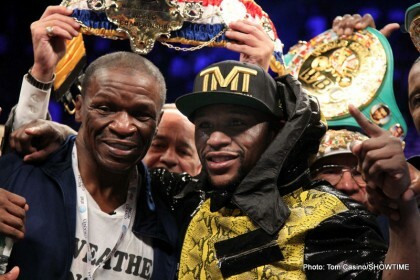 Inside the ropes Floyd is untouchable in a magnificent, but distant way. This is another perverted irony of the boxing game: the object is to hit, and avoid being hit, yet we’re most fond of the fighters who end up on both ends of the punishment. We like our boxers battered, but not completely fried. It’s unfortunate that we can’t appreciate defensive genius, but that’s the rub of the end-swell. In a full contact world, we watch for the hits, not the misses. And that brings us back to the Kenny, and Merchant fiascos; the recent jail time, the generally defiant stance that Mayweather seems to wear like trunks; the fact that his nickname is “Money” Mayweather (face palm. As a rule of thumb, boxers should have nicknames that pertain to boxing. ‘Smokin’ Joe Frazier wasn’t coined because Joe liked to hit the pipe … wait, right?) … we don’t like Floyd. At least, we don’t like who we perceive him to be. I debated this point with a good friend recently who told me that the real problem is our hero complex, and that Floyd doesn’t fit our idea of what a hero should be. That may be true, but it wouldn’t be so bad if Floyd wasn’t such a dead ringer for the villain. Here’s the secret: it’s OK to be an you just can’t act like one. You can make it rain, but don’t flood the whole city! And must you always slap me across the face with your 100 dollar bills? (That’s a metaphor. I’ve actually never met Floyd. Or been slapped … with a 100 dollar bill). Perhaps sensing his career is coming to a close, and more in tune with his legacy than ever, Floyd has been making an effort with the public. He’s less abrasive in interviews, and he even scheduled a fight against an exciting opponent in Saul Alvarez. None of that should matter, really. In a world as perfect as his record, Floyd should have cart blanche. He’s earned it, but somehow he doesn’t qualify for it. It’s like I told a date who was charmed by my wit, but discouraged by my bank account: champions aren’t crowned in numbers, baby, they’re crowned in our hearts. She bought it. Floyd should, too.